Examples of vascular and solid organ trauma are displayed in the images below. Digital subtraction catheter aortogram (early phase) of a typical acute traumatic aortic injury. Digital subtraction catheter aortogram (late phase) of a typical acute traumatic aortic injury (same patient as in the previous image). Contrast-enhanced CT of acute traumatic aortic injury. Vascular and solid organ trauma. 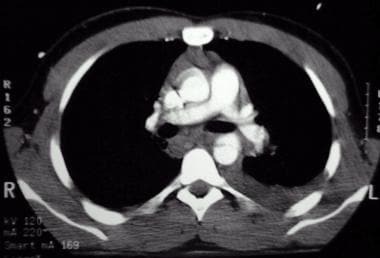 Contrast-enhanced CT of the abdomen in a hemodynamically stable patient with evidence of persistent hemorrhage following a motor vehicle accident. 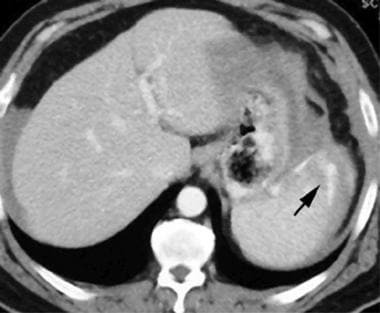 Arrow points to contrast extravasation in a lacerated spleen (Courtesy of the Society of Cardiovascular and Interventional Radiology). Vascular and solid organ trauma. Celiac angiogram (same patient as in the previous image) showing 3 foci of extravasation in spleen, 2 in the upper pole (arrow) and 1 in the lateral aspect of the mid spleen (arrow; courtesy of the Society of Cardiovascular and Interventional Radiology). 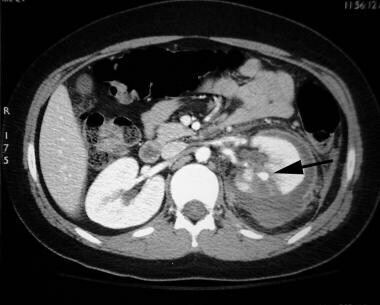 Contrast-enhanced CT of a 65-year-old woman with a remote history of blunt abdominal trauma and severe abdominal pain. 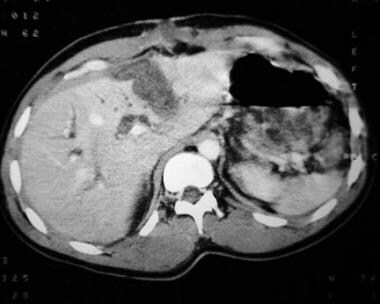 A large pseudoaneurysm is present and is associated with an infarcted segment of the liver. It may be used to grade solid organ injuries. It can detect hemorrhage. On contrast-enhanced scans, extravasation (representing active bleeding) may be represented by a high attenuation focus caused by contrast media leak from a vessel. On non–contrast-enhanced scans, active or recent bleeding may be represented by high attenuation clot or blood (ie, the sentinel clot sign implies ongoing hemorrhage). It may be used to detect vascular abnormalities, such as pseudoaneurysm, intimal dissection, arteriovenous fistula, and vascular occlusion. It is useful in predicting which hemodynamically stable patients may benefit from nonoperative management. A large-field nonselective study, such as an abdominal aortogram, is obtained first. Angiography may detect bleeding and may help in planning further selective studies. Selective studies are performed to detect more subtle hemorrhage and vascular injuries and to direct further treatment, such as transcatheter embolization. Angiography should be obtained early and quickly to diagnose hemorrhage immediately and to exploit an intact clotting cascade should transcatheter embolization be needed. 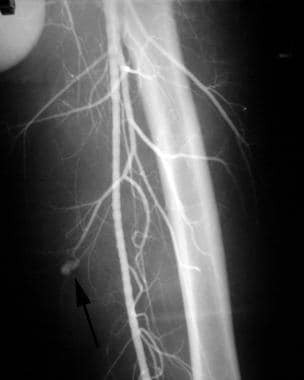 Indications for emergency catheter angiography in the trauma patient include clinical signs or symptoms of hemorrhage or CT evidence of ongoing hemorrhage or vascular injury. In penetrating abdominal trauma, abdominal angiography rarely is indicated, because emergency laparotomy usually is indicated. Transcatheter embolization (embolotherapy) is the intentional occlusion of a vessel by deposition of thrombogenic materials directly into the vessel via an angiographic catheter under remote control. Transcatheter embolization is the mainstay of modern interventional trauma radiology. The arteries to be treated must be expendable or nonessential, or they must supply a relatively infarction-resistant vascular bed. Alternatively, they must be associated with distal collateral vessels, such as selective hepatic arteries; alternatively, if they are true end arteries, they must have adequate parenchymal reserve, as with selective renal artery embolization. Usually, these arteries can be ligated surgically. In trauma, the 2 embolic agents of choice are metallic coils and gelatin sponge. Coils are made of various metals; they are usually fortified with soft fabric material to increase thrombogenicity. Coils have are permanent occluding agents that remain at the site of deposition. They are best applied in single-vessel injuries; are placed quickly with a high degree of accuracy; and are available in a wide variety of sizes, diameters, lengths, and shapes. Detachable coils include mechanical and electrolytic mechanisms of detachment; they are ideal for occluding aneurysmal sac and may be retrieved if placement is suboptimal. Gelatin sponges are a temporary occluding agent; the artery often recanalizes within weeks to months. They are best applied in cases involving single or multiple injuries of smaller arteries and are useful when more distal occlusion is necessary or when multiple collateral channels are present. They are administered as a slurry by mixing gelatin sponge powder with nonionic contrast material or as pledgets of various sizes. Other embolic agents that are used less often in the trauma setting include polyvinyl alcohol(PVA), microspheres, Onyx liquid embolic agent, and N-butyl cyanoacrylate (nBCA) or tissue glue. PVA is a permanent occluding agent. It is available in small-size particles and is administered in a suspension with contrast material. Microspheres are permanent embolic agents that are available in different particle sizes. Onyx is a cohesive liquid agent, which is delivered with a special microcatheter. It causes a permanent occlusion. Tissue glue is an injectable tissue adhesive. It polymerizes into a solid state when exposed to an ionized fluid, such as blood, and causes a permanent occlusion. Stent-grafts or covered stents provide a means of salvaging injured or hemorrhaging arteries and increase the options for transcatheter treatment. Bare stents have been used successfully in the treatment of intimal dissection and pseudoaneurysm, as well as acute rupture. Stent grafts, either custom made or commercially available, are alternatives for treating arterial rupture or pseudoaneurysm in suitable vessels. Stents are covered with vein or synthetic materials, such as polytetrafluoroethylene, polyethylene terephthalate (eg, Dacron), polycarbonate urethane compounds, or other proprietary materials. The stents may be expanded with balloons (iCAST, Atrium) or are self-expandable (Wallgraft, Boston Scientific; Viabahn, Gore; Fluency, BARD). Stents exclude and effectively repair the injured arterial segment. Synonyms for acute thoracic aortic injury (ATAI) include aortic transection, aortic traumatic pseudoaneurysm, aortic rupture, aortic laceration, and aortic tear. ATAIs are responsible for 10-20% of high-speed traffic accident fatalities. More than 8000 cases per year have been documented in the United States. Most ATAIs represent full-thickness tears; in most cases, ATAIs are fatal, with death occurring at the scene of the accident. Of patients with ATAI, 10-23% survive long enough to present to the hospital. Among cases of ATAI in patients who survive, approximately 30% are fatal within 6 hours, and 40% are fatal within 24 hours if undiagnosed and left untreated. Only 2-10% of untreated patients survive longer than 6 months. ATAIs are caused by the rapid deceleration forces produced by high-speed motor vehicle accidents or falls from great heights. During acute deceleration, the thoracic aorta is relatively fixed in position at the aortic root, isthmus, and diaphragm. Movement of the aorta about these points of fixation causes stress and tethering, resulting in a tear at one or more of these locations. Pathologically, a transverse tear of the aortic intima and media is found; in approximately 60% of patients, the adventitia is intact. Of ATAI cases that are fatal at the scene, a higher percentage of lacerations involve the aortic root. Multiple sites of ATAI occur in 6-20% of patients; aortic arch branch artery injuries occur in 4-10% of patients. 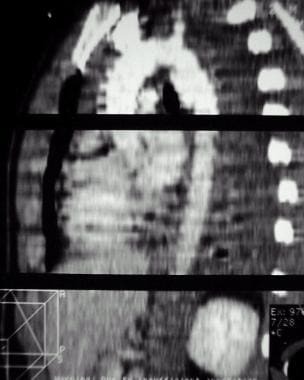 Computed tomography for detection of mediastinal hematoma is superior to chest radiography; it has a lower rate of false-positive results. Isolated aortic injuries without a mediastinal hematoma are rare. Screening for mediastinal hematoma by CT may increase the rate of positive findings on conventional thoracic aortography. It demonstrates a sensitivity of 100% in aortic injury and has a negative predictive value of 100%. CT for detection of aortic injury (see the images below) has a sensitivity of 100% and specificity of 96% in aortic injury. The negative predictive value is 100%. Contrast-enhanced CT of acute traumatic aortic injury (same patient as in the previous image). A 3-dimensional reconstruction of contrast-enhanced CT of acute traumatic aortic injury (same patient as in the previous 2 images). Conventional catheter aortography (see the images below) is the standard of reference to which all other imaging modalities are compared, with a sensitivity of almost 100% and a specificity of 98%. Advantages include good evaluation of ascending thoracic aorta and brachiocephalic arteries. Catheter aortography may be used in conjunction with intravascular ultrasound, and it may be necessary for endovascular (stent-graft) treatment planning. However, to detect a subtle injury, 2 or more views are required. Treatment of ATAI should follow the diagnosis promptly. Most patients require surgical repair of the thoracic aorta, usually with an interposition graft. Some patients are not good operative candidates because of concomitant injuries or comorbidities. Some studies have shown that as many as 70% of patients with blunt splenic injuries may be treated nonoperatively, with success rates of 71-97%. Nonoperative management of splenic injuries is effective in more than 95% of children. Helical CT may be useful in predicting which hemodynamically stable patients may fail nonoperative management if extravasation or posttraumatic splenic vascular injury within the spleen is demonstrated. These patients should be referred for transcatheter embolization of the spleen (see the images below). Vascular and solid organ trauma. 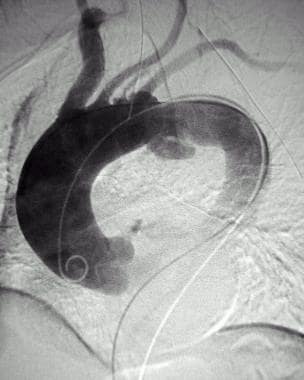 Post—super-selective embolization splenic angiogram demonstrating microcoils in good position and no evidence of further extravasation (same patient as in the previous 2 images; courtesy of the Society of Cardiovascular and Interventional Radiology). The absence of extravasation on conventional angiography may be used to identify patients who may be managed successfully nonoperatively. 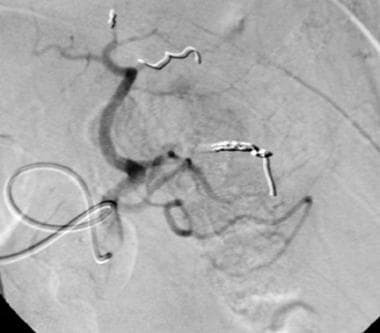 Some investigators have recommended the liberal use of conventional angiography and transcatheter splenic artery embolization to increase the number of patients successfully managed nonoperatively. 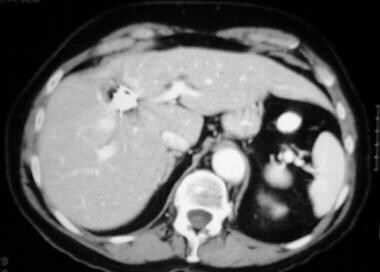 If CT evidence of splenic injury is seen in a hemodynamically stable patient, celiac and splenic angiography is employed. If intrasplenic extravasation is documented, the splenic artery is embolized to occlusion using coils just distal to the dorsal pancreatic artery. 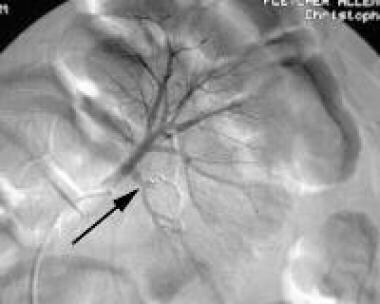 If extrasplenic extravasation is documented, a more distal embolization of the splenic artery branches is performed with gelatin sponge pledgets until extravasation resolves; this is followed by coil embolization of the main splenic artery. This may result in a large percentage of patients being treated nonoperatively with a high success rate. Complications of splenic embolization include inadvertent embolization, splenic infarction and/or abscess, and splenic artery dissection. Contrast-enhanced CT demonstrating a liver laceration in a patient who sustained blunt abdominal trauma (Courtesy of Dr Robert D'Agostino). Vascular and solid organ trauma. 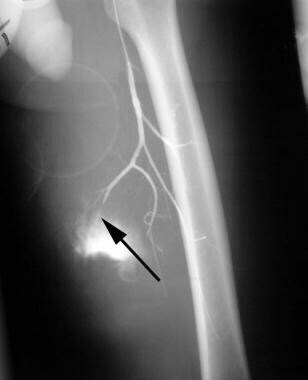 Hepatic angiogram (same patient as in the previous image) showing a pseudoaneurysm of a branch of the left hepatic artery (arrow) located in the region of the hepatic laceration (Courtesy of Dr Robert D'Agostino). Vascular and solid organ trauma. 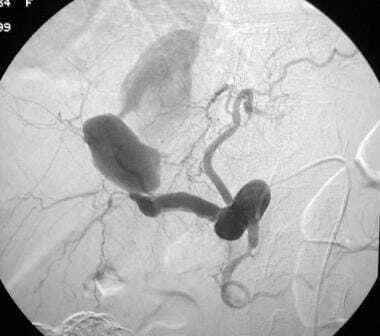 Postembolization angiogram of left hepatic branch artery pseudoaneurysm. The coil (arrow) is in satisfactory position and is occluding the pseudoaneurysm (same patient as in the previous 2 images; courtesy of Dr Robert D'Agostino). Vascular and solid organ trauma. Hepatic angiogram (same patient as in the previous image) demonstrates large bilobed pseudoaneurysm of right hepatic artery. Notice the "jet effect" of contrast material extending from the lower to the upper pseudoaneurysm sac. In addition, an aneurysm of the proper hepatic artery and diffuse ectasia of the proximal right hepatic artery are apparent. Vascular and solid organ trauma. 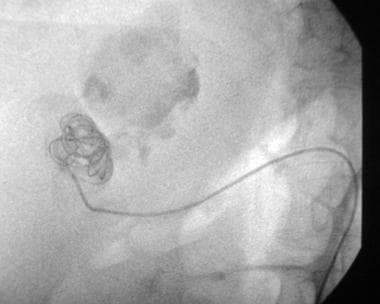 Fluoroscopic control image (same patient as in the previous 2 images) showing a catheter in the lower component of the bilobed pseudoaneurysm. 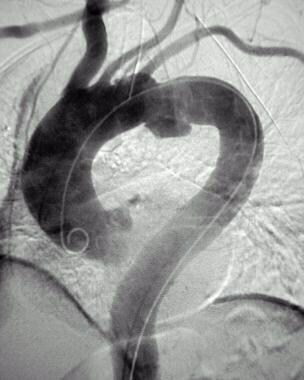 Multiple stainless steel embolization coils have been deposited into the pseudoaneurysm. Vascular and solid organ trauma. 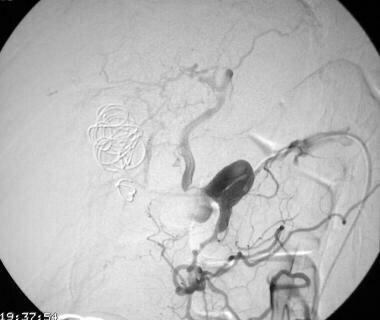 Immediate postembolization hepatic angiogram demonstrating occlusion of the complex right hepatic artery, pseudoaneurysm, and back thrombosis of the entire right hepatic artery (same patient as in the previous 3 images). Vascular and solid organ trauma. Contrast-enhanced 5-month follow-up CT (same patient as in the previous 4 images) demonstrating coils in shrunken pseudoaneurysm sac and scarring in region of previous hepatic infarction. Vascular and solid organ trauma. Celiac angiogram 5-month follow-up image (same patient as in the previous 5 images) showing occlusion of pseudoaneurysm and entire right hepatic, left hepatic, and common hepatic arteries. Penetrating injuries of the liver from stab and gunshot wounds have been managed successfully with transcatheter embolization using criteria similar to those used in cases of blunt hepatic injury. 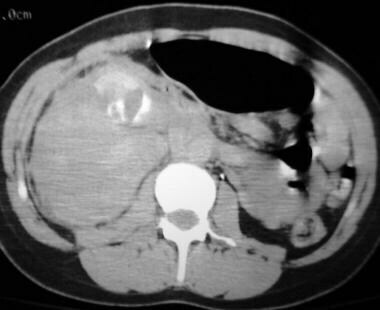 Contrast-enhanced CT in a 9-year-old boy who sustained blunt abdominal injury after falling onto the handle bar of his bicycle. He presented with exsanguinating hematuria caused by a fractured left kidney. CT demonstrates a pseudoaneurysm (arrow) off of an intrarenal artery branch. Left renal angiogram (early phase; same patient as in the previous image shows the faint opacification of a pseudoaneurysm (arrow), which correlates with the CT finding. 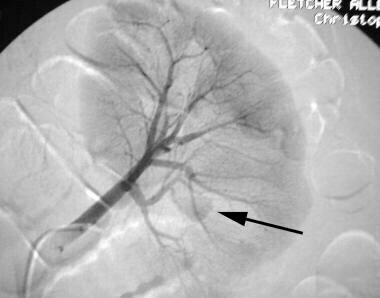 Left renal angiogram (late phase; same patient as in the previous 2 images) shows the faint opacification of a pseudoaneurysm (arrow), which correlates with the CT finding. 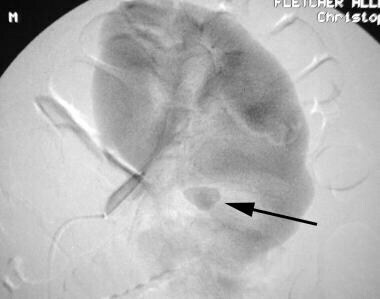 Postembolization left renal angiogram (same patient as in the previous 3 images) shows stainless steel embolization coil (arrow) completely occluding the renal artery branch previously containing the pseudoaneurysm. A 30-year-old woman who sustained blunt abdominal trauma. 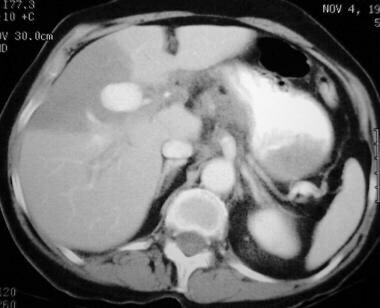 Contrast-enhanced CT demonstrates a large perirenal hematoma and a fractured right kidney. CT evidence of acute extravasation is present. 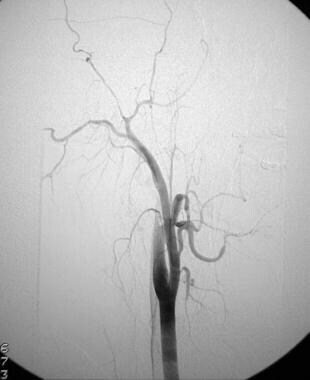 Selective renal angiogram (same patient as in the previous image) reveals a vascular pedicle injury with an avulsed renal artery branch, multiple renal artery branch occlusions, and an inhomogeneous nephrogram but no active extravasation. Major devascularization is present. The patient had signs of persistent hemorrhage and was hypotensive. 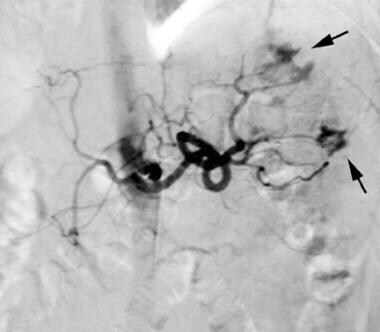 Immediate postembolization renal angiogram demonstrates a satisfactory position of stainless steel coils effectively occluding the main right renal artery. A surgical nephrectomy was planned (same patient as in the previous 2 images). Although the treatment of more severe grade III renal injuries is more controversial, there is a trend to treat these injuries nonoperatively as well. In more severe kidney injuries, surgery results in nephrectomy in as many as one third of patients. A perinephric hematoma usually is contained partly by the Gerota fascia. When this is opened with surgery, significant blood loss may occur if vascular control is not obtained promptly. Thus, the physician may elect to perform a trial of transcatheter embolization of the bleeding sites or vascular abnormalities. Grade IV or V blunt renal injuries usually require surgery for definitive treatment, which also may result in nephrectomy; however, some of these injuries may be managed nonoperatively. In cases of penetrating renal trauma, surgical exploration is commonly employed, particularly if the peritoneum has been transgressed. Conventional angiography may delineate precisely the status of the renal vasculature preoperatively; it may be a prelude to transcatheter embolization in a limited number of cases (see the images below). 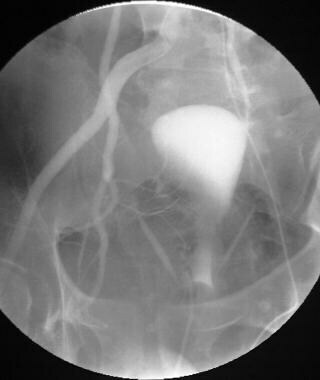 Selective left renal angiogram in an older man with an expanding retroperitoneal hematoma. This was secondary to penetrating trauma to the flank following an encounter with an angry bull. The arrow delineates the avulsed left renal artery branch to the upper pole of the left kidney (Courtesy of Dr Kenneth E Najarian). 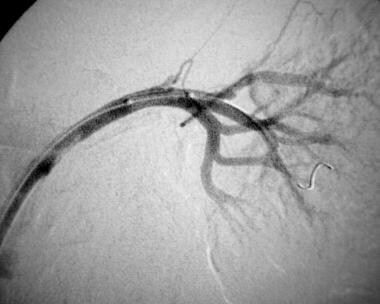 Control angiogram (same patient as in the previous image) obtained immediately before deployment of a custom-made stent -graft across the origin of the avulsed left renal artery branch. The balloon-mounted stent-graft is in a good position and is ready to be deployed (Courtesy of Dr Kenneth E Najarian). 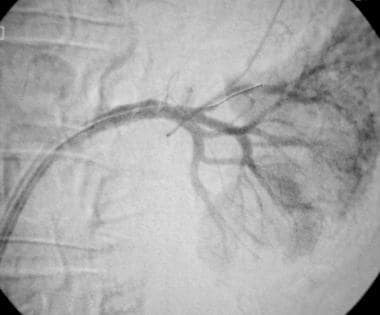 Post–stent-graft deployment left renal angiogram (same patient as in the previous 2 images). The avulsed branch artery has been excluded effectively (Courtesy of Dr Kenneth E Najarian). The kidney is an end-artery organ with minor transcapsular and intrarenal collaterals. Superselective distal embolization with Gelfoam pledgets or microcoils is desirable. Transcatheter embolization of injuries to the branch arteries is successful in 84-100% of patients. Continued bleeding may indicate an arterial source; such bleeding is associated with high morbidity and mortality rates. Intractable hemorrhage associated with pelvic fracture is a large contributor to the overall mortality rate of approximately 10%. Surgical exploration and intervention of a pelvic hematoma often is complex, owing to the difficulties in visualizing the hemorrhaging artery or arteries within the extraperitoneal hematoma and in gaining arterial control. In addition, an operation exposes the patient to the added risk of increased blood loss through surgical disruption of the pelvic fascia; this may be important in the tamponade of the hematoma. Transcatheter embolization of pelvic trauma that is performed early, within 3 hours of presentation, has been shown to lower the mortality rate. Overall, angiography is required in fewer than 10% of patients with pelvic trauma. When angiography is performed, extravasation is documented in approximately one half of patients; in such cases, transcatheter embolization is warranted. As with other injuries, Cerva et al and Stephen et al have shown that CT is indispensable in diagnosing and monitoring pelvic hemorrhage. [67, 68] CT also is necessary in making the diagnosis of and classifying pelvic fractures and/or dislocations. The sensitivity and specificity of CT for active extravasation in cases of pelvic trauma is 80-84% and 85-98%, respectively. CT evidence of extravasation in the pelvis is an indication for transcatheter embolization. In pelvic trauma, arterial bleeding most frequently occurs from superior gluteal and internal pudendal arteries. The fascia of the piriformis muscle may lacerate the superior gluteal artery, even in the absence of fracture. All branches of the hypogastric artery are at risk for bleeding. Knowledge of the relationship of branch arteries of the hypogastric artery to the surrounding and adjacent musculotendinous and ligamentous structures is helpful in predicting arterial injuries and in directing selective catheterization for angiography. Pelvic and retroperitoneal hemorrhage also may arise from the lumbar, inferior epigastric, deep circumflex iliac, and middle sacral arteries. For pelvic angiography, access from the common femoral artery contralateral to the pelvic hematoma, fracture, or extravasation is demonstrated on CT (see the images below). Unsubtracted right iliac angiogram in a young woman who had evidence of continued hemorrhage from a pelvic fracture and/or dislocation following a motor vehicle accident. Mass effect from a large right-sided pelvic hematoma is identified compressing and displacing the urinary bladder to the left. Digital subtraction right iliac angiogram (same patient as in the previous image) demonstrating acute extravasation (arrows) from the right superior and inferior lateral sacral arteries, arising off of the posterior division of the right hypogastric artery. 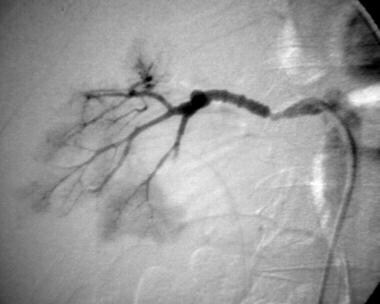 Right iliac artery angiogram (early phase) following transcatheter embolization of lateral sacral arteries showing no further extravasation from these vessels. Some inadvertent embolic occlusion of the posterior division of the right hypogastric artery also is evident (same patient as in the previous 2 images). 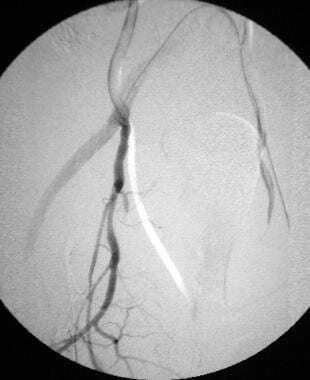 Right iliac artery angiogram (late phase) following transcatheter embolization of lateral sacral arteries, showing no further extravasation from these vessels. An acute extravasation now is identified from the right internal pudendal artery (arrow; same patient as in the previous 3 images). Final postembolization right iliac study showing occlusion of much of the posterior division and internal pudendal artery of the right hypogastric artery. No extravasation is evident (same patient as in the previous 4 images). Final postembolization right iliac study showing occlusion of much of the posterior division and internal pudendal artery of the right hypogastric artery. No extravasation is evident (same patient as in the previous 5 images). Initially, nonselective pelvic angiography is performed from a catheter in the lower abdominal aorta. 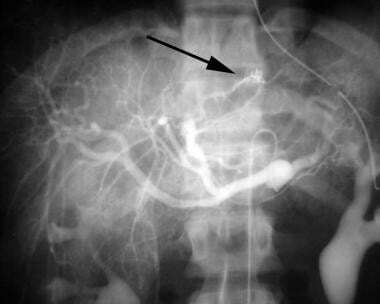 Next, the hypogastric artery of interest is selected, and selective hypogastric angiography is performed. Microcatheters are needed for superselective angiography and embolization. 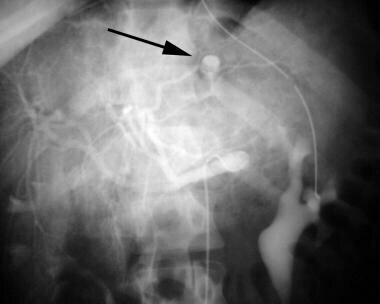 Brisk hemorrhage may be evident on nonselective pelvic angiogram, but subtle extravasation may require selective or subselective angiography for detection. If possible, and when the source of extravasation is defined, superselective embolization with gelatin sponge pledgets of 1-2 mm in diameter or slurry is optimal. Proximal coil embolization is less attractive for distal extravasation because it makes future access difficult (should it be needed) and because the exuberant distal collateralization of the pelvic vasculature renders this technique ineffective. 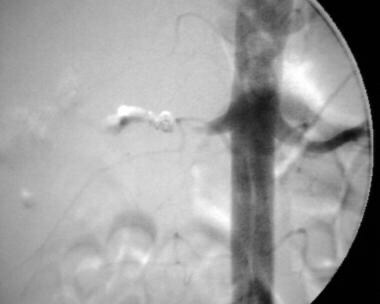 Proximal coil embolization for proximal hypogastric artery injury should be performed; it may be performed after embolization with distal gelatin sponge pledgets. In patients with massive hemorrhage, nonselective embolization using gelatin sponge pledgets from the hypogastric artery position is acceptable; with this approach, bleeding may be quickly arrested. Empirical embolization of both hypogastric arteries may be performed if no bleeding site is identified on angiography but there is clinical or CT evidence of hemorrhage. 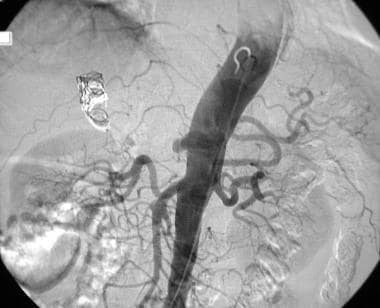 A postembolization nonselective angiogram should be performed to exclude additional extravasation sites and to ensure that collateral vessels are not causing retrograde (backfill) hemorrhage; in such cases, further embolization is required. For pelvic transcatheter embolization, the success rate of stopping hemorrhage is 85-100%. Despite high technical success rates, the mortality rate is approximately 50% because of concomitant injuries. 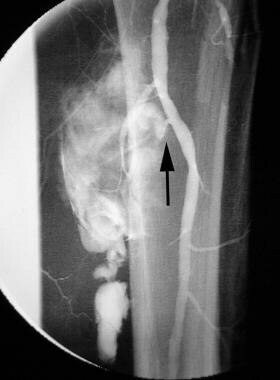 Inadvertent embolization — Occurs only rarely, provided catheter position is satisfactory and the embolization procedure is terminated once occlusion is established. Cut-film angiogram of a young man with an expanding hematoma following a stab wound to the right thigh. 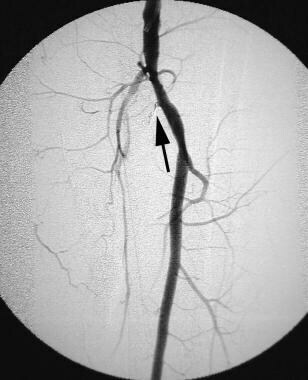 Extravasation (arrow) is identified from a medial muscular branch of the right profunda femoral artery (Courtesy of Dr Robert D'Agostino). 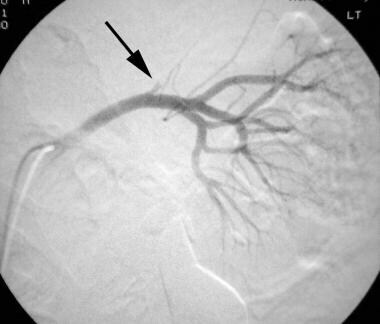 Postembolization angiogram of descending right profunda femoral artery branch demonstrating successful embolic occlusion of the medial muscular branch with a microcoil (arrow). 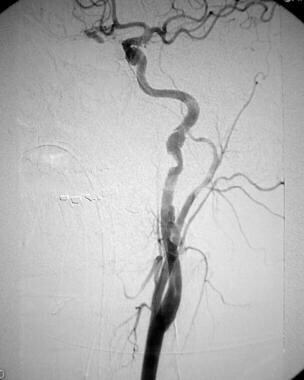 The contrast material extravasation occurred prior to the embolic occlusion (same patient as in the previous image; courtesy of Dr Robert D'Agostino). Digital subtraction left lower extremity angiogram of a young man who presented with continuous hemorrhage from open wounds of his left calf. He had previously been treated with a fasciotomy after sustaining trauma to his left leg following a pedestrian-vs-automobile encounter. 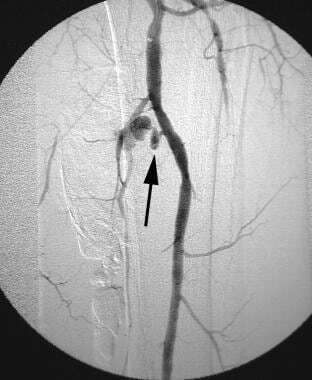 Extravasation (arrow) from the proximal left peroneal artery is present. The peroneal artery provides the only arterial runoff down the leg. 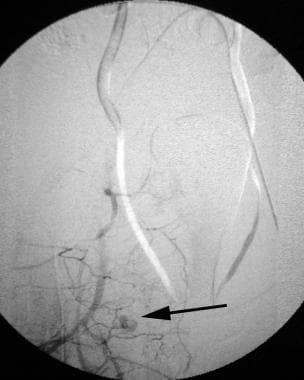 Final postembolization left lower extremity angiogram following placement of a detachable microcoil (arrow) within the rent of the left peroneal artery, which preserved flow down the left leg. No further extravasation is identified (same patient as in the previous 2 images). Catheter angiography is indicated in cases of known or suspected peripheral vascular injury when the location of the injury is not certain, when multiple injury sites may be present, when the diagnosis requires confirmation, or when transcatheter treatment may be the therapy of choice. The mechanisms of injury differ for penetrating trauma and blunt trauma. In penetrating trauma, the vascular injury may be produced by the direct penetration of the object through the vessel, with resulting disruption, or by dissipation of kinetic energy within the tissues adjacent to the vessel. In the case of low-velocity objects such as knives, the object must traverse the vessel, and the object must penetrate it to cause injury. In blunt trauma, shearing and direct compression forces are involved. A direct compression or crushing force may produce an injury such as a mural contusion. The shearing mechanism, which occurs with stretching or traction forces, produces complete transection or intimal or medial dissection, which may result in the formation of a pseudoaneurysm. In addition, severe extrinsic compression from such entities as an adjacent hematoma, a fracture fragment, a dislocation, or edema, may cause severe narrowing of the vessel, which in turn may result in thrombosis. Vasospasm may occur as an isolated injury or in association with the above-mentioned vascular insults. For transcatheter embolization, the artery to be embolized must be nonessential or expendable. This is an alternative to surgical ligation. It provides optimal treatment when surgical access is limited or difficult and requires ligation of additional collateral arteries. 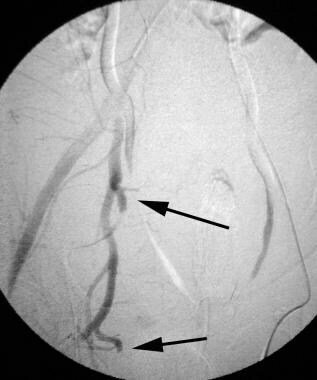 Embolization may be performed for pseudoaneurysm and arteriovenous fistula. Embolization should be performed proximally and distally to the lesion to prevent backfilling through collateral vessels. Consideration should be given to embolizing the neck of a pseudoaneurysm or arteriovenous fistula to preserve the parent vessel. A success rate of 85-100% is reported. For stents and stent-grafts, experience with stents in cases of trauma is limited. Stents have the potential to preserve injured arteries. Cut-film left subclavian angiogram in a young patient with a gunshot wound demonstrating a proximity injury of the left subclavian artery. A laceration causing extravasation is present. The projectile is located over the left shoulder joint (Courtesy of Dr Robert D'Agostino). 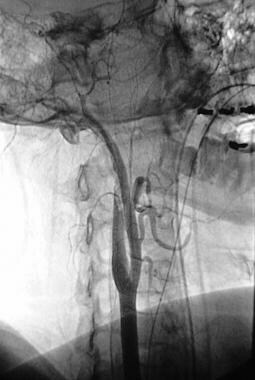 Digital subtraction angiogram of cervical right carotid arteries in a comatose 33-year-old man who sustained neck trauma in a snowmobile accident. Complete occlusion of the right internal carotid artery is present. Blunt injuries of the carotid and vertebral arteries appear to be more common than previously suggested. Early diagnosis and treatment of these injuries improves neurologic outcome. Aggressive screening protocols may increase the diagnosis of these injuries; the failure to diagnose and treat these lesions may result in a devastating and permanent neurologic injury. The pathophysiology of blunt carotid and cervical injuries usually is dissection, which may result in a stenosis, pseudoaneurysm formation, or both. Extracranial internal carotid injuries are much more common than intracranial internal carotid injuries; they usually originate at the C2-C3 vertebral level and terminate at the base of the carotid canal. Historically, treatment of blunt injuries of the carotid and vertebral arteries included anticoagulation and antiplatelet therapy, although some patients required surgical repair. More recently, reports and series documenting the successful management and definitive treatment of blunt internal carotid artery injuries with endovascular stents have been published. [83, 84] Unilateral injuries of the vertebral artery often are treated with transcatheter embolization; such treatment requires that the contralateral vertebral artery be patent and of normal appearance. Conventional catheter angiography remains the standard of reference to which all other imaging modalities are compared. Advantages include accuracy and facilitation of treatment through transcatheter embolization or endovascular stent or stent-graft placement. Disadvantages include the fact that it is not universally available in a timely fashion; it is invasive, with a small risk of catheter-induced stroke; and it is expensive. Ultrasonography requires less experience in the trauma setting; it can be quickly performed and is inexpensive; and it is portable and therefore can be used at the bedside. However, it is operator dependent and is less effective in zone-1 and zone-3 injuries and injuries of the vertebral artery. Magnetic resonance angiography requires little experience in the acute trauma setting. It may be used in conjunction with imaging of the CNS and does not require administration of iodinated contrast material. However, it is susceptible to motion artifact; it requires MRI-compatible life-support devices; it is not universally available; and its efficacy is not yet proven. CT angiography evaluation often is obtained in stable trauma patients. It provides fast imaging from aortic arch to intracerebral vasculature and may be used in conjunction with imaging of the CNS and spine. It does, however, require iodinated contrast material; it is not universally available; and its efficacy has not been proven. With regard to endovascular management, multiple small series and case reports with follow-up periods of up to 2.5 years suggest that the use of metallic stent placement is effective in treating traumatic pseudoaneurysm of the internal carotid artery. Bjarnason H. Vascular embolotherapy. In: Ferral H, Bjarnason H, Qian Z, eds. Synopsis of Castaneda's Interventional Radiology. Lippincott Williams & Wilkins. 2001:27-45. Körner M, Krötz MM, Degenhart C, Pfeifer KJ, Reiser MF, Linsenmaier U. Current Role of Emergency US in Patients with Major Trauma. Radiographics. 2008 Jan-Feb. 28(1):225-42. [Medline]. Glorsky SL, Wonderlich DA, Goei AD. Evaluation and management of the trauma patient for the interventional radiologist. Semin Intervent Radiol. 2010 Mar. 27(1):29-37. [Medline]. [Full Text]. Legiehn GM, Heran MK. A Step-by-Step Practical Approach to Imaging Diagnosis and Interventional Radiologic Therapy in Vascular Malformations. Semin Intervent Radiol. 2010 Jun. 27(2):209-31. [Medline]. [Full Text]. Sidhu MK, Hogan MJ, Shaw DW, Burdick T. Interventional radiology for paediatric trauma. Pediatr Radiol. 2009 May. 39(5):506-15. [Medline]. Vo JN, Hoffer FA, Shaw DW. 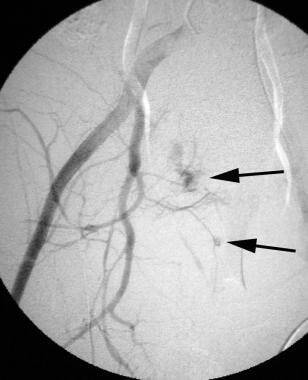 Techniques in vascular and interventional radiology: pediatric central venous access. Tech Vasc Interv Radiol. 2010 Dec. 13(4):250-7. [Medline]. Zealley IA, Chakraverty S. The role of interventional radiology in trauma. BMJ. 2010 Feb 8. 340:c497. [Medline]. Harper K, Shah KH. Renal trauma after blunt abdominal injury. J Emerg Med. 2013 Sep. 45(3):400-4. [Medline]. Harris T, Davenport R, Hurst T, Hunt P, Fotheringham T, Jones J. Improving outcome in severe trauma: what's new in ABC? Imaging, bleeding and brain injury. Postgrad Med J. 2012 Oct. 88(1044):595-603. [Medline]. Blackmore CC, Zweibel A, Mann FA. Determining risk of traumatic aortic injury: how to optimize imaging strategy. AJR Am J Roentgenol. 2000 Feb. 174(2):343-7. [Medline]. Dyer DS, Moore EE, Mestek MF, et al. 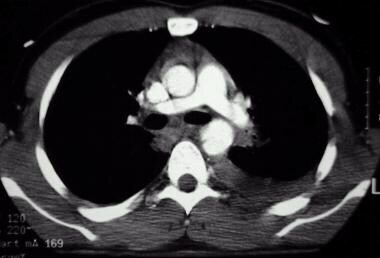 Can chest CT be used to exclude aortic injury?. Radiology. 1999 Oct. 213(1):195-202. [Medline]. Belli AM, Markose G, Morgan R. The Role of Interventional Radiology in the Management of Abdominal Visceral Artery Aneurysms. Cardiovasc Intervent Radiol. 2011 Jun 15. [Medline]. Raptis CA, Hammer MM, Raman KG, Mellnick VM, Bhalla S. Acute traumatic aortic injury: practical considerations for the diagnostic radiologist. J Thorac Imaging. 2015 May. 30 (3):202-13. [Medline]. Rousseau H, Soula P, Perreault P, et al. Delayed treatment of traumatic rupture of the thoracic aorta with endoluminal covered stent. Circulation. 1999 Feb 2. 99(4):498-504. [Medline]. Temudom T, D'Ayala M, Marin ML. Endovascular grafts in the treatment of thoracic aortic aneurysms and psuedoaneurysms. Ann Vasc Surg. 2000. 14:230-8. Semba CP, Kato N, Kee ST, et al. 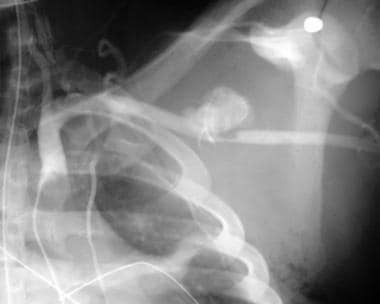 Acute rupture of the descending thoracic aorta: repair with use of endovascular stent-grafts. J Vasc Interv Radiol. 1997 May-Jun. 8(3):337-42. [Medline]. Fujikawa T, Yukioka T, Ishimaru S, et al. Endovascular stent grafting for the treatment of blunt thoracic aortic injury. J Trauma. 2001 Feb. 50(2):223-9. [Medline]. Day CP, Buckenham TM. Outcomes of Endovascular Repair of Acute Thoracic Aortic Injury: Interrogation of the New Zealand Thoracic Aortic Stent Database (NZ TAS). Eur J Vasc Endovasc Surg. 2008 Sep 18. [Medline]. Riesenman PJ, Farber MA, Rich PB, Sheridan BC, Mendes RR, Marston WA, et al. Outcomes of surgical and endovascular treatment of acute traumatic thoracic aortic injury. J Vasc Surg. 2007 Nov. 46(5):934-40. [Medline]. Broux C, Thony F, Chavanon O, Bach V, Hacini R, Sengel C, et al. Emergency endovascular stent graft repair for acute blunt thoracic aortic injury: a retrospective case control study. Intensive Care Med. 2006 May. 32(5):770-4. [Medline]. Kohn JS, Clark DE, Isler RJ, Pope CF. Is computed tomographic grading of splenic injury useful in the nonsurgical management of blunt trauma?. J Trauma. 1994 Mar. 36(3):385-9; discussion 390. [Medline]. Malangoni MA, Cue JI, Fallat ME, et al. Evaluation of splenic injury by computed tomography and its impact on treatment. Ann Surg. 1990 May. 211(5):592-7; discussion 597-9. [Medline]. Sclafani SJ, Weisberg A, Scalea TM, et al. Blunt splenic injuries: nonsurgical treatment with CT, arteriography, and transcatheter arterial embolization of the splenic artery. Radiology. 1991 Oct. 181(1):189-96. [Medline]. Sugg SL, Gerndt SJ, Hamilton BJ, et al. Pseudoaneurysms of the intraparenchymal splenic artery after blunt abdominal trauma: a complication of nonoperative therapy and its management. J Trauma. 1995 Sep. 39(3):593-5. [Medline]. Villalba MR, Howells GA, Lucas RJ, et al. Nonoperative management of the adult ruptured spleen. Arch Surg. 1990 Jul. 125(7):836-8; discussion 838-9. [Medline]. Poletti PA, Becker CD, Arditi D, Terraz S, Buchs N, Shanmuganathan K, et al. Blunt splenic trauma: can contrast enhanced sonography be used for the screening of delayed pseudoaneurysms?. Eur J Radiol. 2013 Nov. 82 (11):1846-52. [Medline]. Notash AY, Amoli HA, Nikandish A, Kenari AY, Jahangiri F, Khashayar P. Non-operative management in blunt splenic trauma. Emerg Med J. 2008 Apr. 25(4):210-2. [Medline]. Sinha S, Raja SV, Lewis MH. Recent changes in the management of blunt splenic injury: effect on splenic trauma patients and hospital implications. Ann R Coll Surg Engl. 2008 Mar. 90(2):109-12. [Medline]. Harbrecht BG, Zenati MS, Ochoa JB, Puyana JC, Alarcon LH, Peitzman AB. Evaluation of a 15-year experience with splenic injuries in a state trauma system. Surgery. 2007 Feb. 141(2):229-38. [Medline]. Sclafani SJ, Shaftan GW, Scalea TM, et al. Nonoperative salvage of computed tomography-diagnosed splenic injuries: utilization of angiography for triage and embolization for hemostasis. J Trauma. 1995 Nov. 39(5):818-25; discussion 826-7. [Medline]. Shanmuganathan K, Mirvis SE, Boyd-Kranis R. Nonsurgical management of blunt splenic injury: use of CT criteria to select patients for splenic arteriography and potential endovascular therapy. Radiology. 2000. 217:75-82. Brasel KJ, DeLisle CM, Olson CJ, Borgstrom DC. Splenic injury: trends in evaluation and management. J Trauma. 1998 Feb. 44(2):283-6. [Medline]. Croce MA, Fabian TC, Menke PG, et al. Nonoperative management of blunt hepatic trauma is the treatment of choice for hemodynamically stable patients. Results of a prospective trial. Ann Surg. 1995 Jun. 221(6):744-53; discussion 753-5. [Medline]. Hagiwara A, Yukioka T, Ohta S, et al. Nonsurgical management of patients with blunt hepatic injury: efficacy of transcatheter arterial embolization. AJR Am J Roentgenol. 1997 Oct. 169(4):1151-6. [Medline]. Meredith JW, Young JS, Bowling J, Roboussin D. Nonoperative management of blunt hepatic trauma: the exception or the rule?. J Trauma. 1994 Apr. 36(4):529-34; discussion 534-5. [Medline]. Pachter HL, Knudson MM, Esrig B, et al. Status of nonoperative management of blunt hepatic injuries in 1995: a multicenter experience with 404 patients. J Trauma. 1996 Jan. 40(1):31-8. [Medline]. Schwartz RA, Teitelbaum GP, Katz MD, Pentecost MJ. Effectiveness of transcatheter embolization in the control of hepatic vascular injuries. J Vasc Interv Radiol. 1993 May-Jun. 4(3):359-65. [Medline]. Jaik NP, Hoey BA, Stawicki SP. Evolving role of endoscopic retrograde cholangiopancreatography in management of extrahepatic hepatic ductal injuries due to blunt trauma: diagnostic and treatment algorithms. HPB Surg. 2008. 2008:259141. [Medline]. Scalora MA, Gross RI, Burns KJ. Management of blunt hepatic trauma at a Connecticut Level I trauma center. Conn Med. 2007 Oct. 71(9):529-32. [Medline]. Kutcher ME, Weis JJ, Siada SS, Kaups KL, Kozar RA, Wawrose RA, et al. The role of computed tomographic scan in ongoing triage of operative hepatic trauma: A Western Trauma Association multicenter retrospective study. J Trauma Acute Care Surg. 2015 Sep 2. [Medline]. Hagiwara A, Yukioka T, Ohta S, et al. Nonsurgical management of patients with blunt splenic injury: efficacy of transcatheter arterial embolization. AJR Am J Roentgenol. 1996 Jul. 167(1):159-66. [Medline]. Ciraulo DL, Luk S, Palter M, et al. Selective hepatic arterial embolization of grade IV and V blunt hepatic injuries: an extension of resuscitation in the nonoperative management of traumatic hepatic injuries. J Trauma. 1998 Aug. 45(2):353-8; discussion 358-9. [Medline]. Corr P, Hacking G. Embolization in traumatic intrarenal vascular injuries. Clin Radiol. 1991 Apr. 43(4):262-4. [Medline]. Mansi MK, Alkhudair WK. Conservative management with percutaneous intervention of major blunt renal injuries. Am J Emerg Med. 1997 Nov. 15(7):633-7. [Medline]. Uflacker R, Paolini RM, Lima S. Management of traumatic hematuria by selective renal artery embolization. J Urol. 1984 Oct. 132(4):662-7. [Medline]. Kitase M, Mizutani M, Tomita H, Kono T, Sugie C, Shibamoto Y. Blunt renal trauma: comparison of contrast-enhanced CT and angiographic findings and the usefulness of transcatheter arterial embolization. Vasa. 2007 May. 36(2):108-13. [Medline]. Sarani B, Powell E, Taddeo J, Carr B, Patel A, Seamon M, et al. Contemporary comparison of surgical and interventional arteriography management of blunt renal injury. J Vasc Interv Radiol. 2011 May. 22(5):723-8. [Medline]. Lin WC, Lin CH. The role of interventional radiology for pediatric blunt renal trauma. Ital J Pediatr. 2015 Oct 15. 41 (1):76. [Medline]. Bonatti M, Lombardo F, Vezzali N, Zamboni G, Ferro F, Pernter P, et al. MDCT of blunt renal trauma: imaging findings and therapeutic implications. Insights Imaging. 2015 Apr. 6 (2):261-72. [Medline]. Eastham JA, Wilson TG, Larsen DW, Ahlering TE. Angiographic embolization of renal stab wounds. J Urol. 1992 Aug. 148(2 Pt 1):268-70. [Medline]. Eastham JA, Wilson TG, Ahlering TE. Radiographic evaluation of adult patients with blunt renal trauma. J Urol. 1992 Aug. 148(2 Pt 1):266-7. [Medline]. Eastham JA, Wilson TG, Ahlering TE. Urological evaluation and management of renal-proximity stab wounds. J Urol. 1993 Dec. 150(6):1771-3. [Medline]. Hanks SE, Katz MD. Arteriography and transcatheter embolization in the management of renal trauma. In: Baum S, Penticost MJ, eds. Abram's Angiography. 4th ed. Boston: Little, Brown and Co. 1997:892-6. Heyns CF, van Vollenhoven P. Increasing role of angiography and segmental artery embolization in the management of renal stab wounds. J Urol. 1992 May. 147(5):1231-4. [Medline]. Ezra N, Afari A, Wong J. Pelvic and scrotal trauma: CT and triage of patients. Abdom Imaging. 2008 Jun 10. [Medline]. O'Connor PJ, Barron D. MRI assessment of pelvic trauma. Semin Musculoskelet Radiol. 2006 Dec. 10(4):345-56. [Medline]. Otal P, Auriol J, Chabbert V, Lemettre T, Marachet MA, Canevet G, et al. [Interventional radiology and thoraco-abdomino-pelvic trauma]. J Radiol. 2008 Nov. 89(11 Pt 2):1855-70. [Medline]. Agolini SF, Shah K, Jaffe J, et al. Arterial embolization is a rapid and effective technique for controlling pelvic fracture hemorrhage. J Trauma. 1997 Sep. 43(3):395-9. [Medline]. Panetta T, Sclafani SJ, Goldstein AS, et al. Percutaneous transcatheter embolization for massive bleeding from pelvic fractures. J Trauma. 1985 Nov. 25(11):1021-9. [Medline]. Ben-Menachem Y, Coldwell DM, Young JW, Burgess AR. Hemorrhage associated with pelvic fractures: causes, diagnosis, and emergent management. AJR Am J Roentgenol. 1991 Nov. 157(5):1005-14. [Medline]. Cerva DS Jr, Mirvis SE, Shanmuganathan K, et al. Detection of bleeding in patients with major pelvic fractures: value of contrast-enhanced CT. AJR Am J Roentgenol. 1996 Jan. 166(1):131-5. [Medline]. Stephen DJ, Kreder HJ, Day AC, et al. Early detection of arterial bleeding in acute pelvic trauma. J Trauma. 1999 Oct. 47(4):638-42. [Medline]. Katz MD, Hanks SE. Arteriography and transcatheter treatment of extremity trauma. In: Baum S, Pentecost MJ, eds. Abram's Angiography. 4th ed. Boston: Little, Brown and Co. 1997:857-9. Schwartz MR, Weaver FA, Bauer M, et al. Refining the indications for arteriography in penetrating extremity trauma: a prospective analysis. J Vasc Surg. 1993 Jan. 17(1):116-22; discussion 122-4. [Medline]. Smyth SH, Pond GD, Johnson PL, et al. Proximity injuries: correlation with results of extremity arteriography. J Vasc Interv Radiol. 1991 Nov. 2(4):451-4; discussion 454-6. [Medline]. Compton C, Rhee R. Peripheral vascular trauma. Perspect Vasc Surg Endovasc Ther. 2005 Dec. 17(4):297-307. [Medline]. Patel MC, Levin DC, Parker L, Rao VM. Have CT and MR Angiography Replaced Catheter Angiography in Diagnosing Peripheral Arterial Disease?. J Am Coll Radiol. 2015 Sep. 12 (9):909-14. [Medline]. O'Sullivan GJ. The role of interventional radiology in the management of deep venous thrombosis: advanced therapy. Cardiovasc Intervent Radiol. 2011 Jun. 34(3):445-61. [Medline]. Criado E, Marston WA, Ligush J. Endovascular repair of peripheral aneurysms, pseudoaneurysms, and arteriovenous fistulas. Ann Vasc Surg. 1997. 11:256-63. Marin ML, Veith FJ, Cynamon J. Initial experience with transluminally placed endovascular grafts for the treatment of complex vascular lesions. Ann Surg. 1995. 222:449-65. Bejjani GK, Monsein LH, Laird JR, et al. Treatment of symptomatic cervical carotid dissections with endovascular stents. Neurosurgery. 1999 Apr. 44(4):755-60; discussion 760-1. [Medline]. Biffl WL, Moore EE, Offner PJ, et al. Blunt carotid arterial injuries: implications of a new grading scale. J Trauma. 1999 Nov. 47(5):845-53. [Medline]. Bok AP, Peter JC. Carotid and vertebral artery occlusion after blunt cervical injury: the role of MR angiography in early diagnosis. J Trauma. 1996 Jun. 40(6):968-72. [Medline]. Sclafani AP, Sclafani SJ. Angiography and transcatheter arterial embolization of vascular injuries of the face and neck. Laryngoscope. 1996 Feb. 106(2 Pt 1):168-73. [Medline]. Coldwell DM, Novak Z, Ryu RK, et al. Treatment of posttraumatic internal carotid arterial pseudoaneurysms with endovascular stents. J Trauma. 2000 Mar. 48(3):470-2. [Medline]. Liu AY, Paulsen RD, Marcellus ML, et al. Long-term outcomes after carotid stent placement treatment of carotid artery dissection. Neurosurgery. 1999 Dec. 45(6):1368-73; discussion 1373-4. [Medline]. Digital subtraction catheter aortogram of acute traumatic aortic injury (same patient as in the previous 3 images).